K.R. 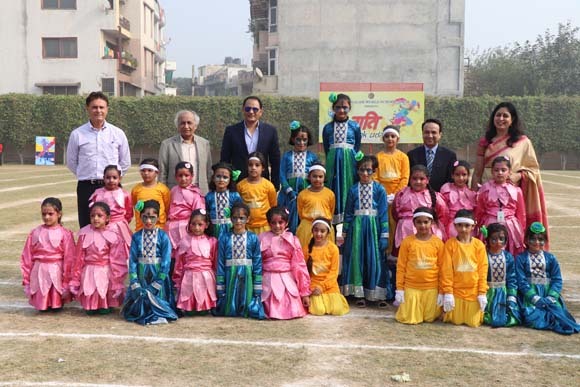 Mangalam World School, G.K-II organised its Annual Cultural Sports Splendor ‘Gati-Ek Udaan…a fusion of vigor , celebration and euphoria, on 2 December, 2016.The occasion was graced by the benign presence of, Mohammad Azharuddin, former Indian Cricket Captain and politician, the Chief Guest of the day, Shri Yash Dev Gupta, Chairman ,K.R. Mangalam Group of Schools ,Shri Jai Dev Gupta, Vice Chairman, K.R. Mangalam Group of Schools, Shri Inder Dev Gupta, Member of the school management committee. The spirit of harmony and togetherness engulfed the atmosphere with the vibrating rendition of the young stars as they presented the musical encomium, ‘Udd Chale Parindey’. The stage set the right tone and atmosphere with a concoction of the popular dance forms presented by the Pre-Primary students. Extending a warm welcome to all the distinguished guests, the Principal, Ms. Alka Awasthi, congratulated and encouraged the vivacious learners for putting up such a spectacular show .She also accentuated that real learning is the amalgamation of education with sports. This was followed by an athletic act ‘Pomping the Pom’ where the tiny tots showcased their prowess and poise as they synchronized the beat of the pom poms to the rhythm of music, which indeed left the audience spell-bound. The fearless fighters with their strong punches and high kicks proved their mettle by displaying varied acts of self-defense. The spectacle created by the bustling butterflies as they spread their vibrant hues was indeed breathtaking. This was followed by an energetic yoga performance ‘Abhyantara-The art of well-being’, performed by the students of class II. Various track events like Sack Race, Umbrella Race , Dress Up Race etc. were held wherein the young athletes of KRM showed their undaunting spirit and emerged victorious among their peers .This was followed by a scintillating dance performance ‘Mother Earth–Hamari Maa’, where the students paid a tribute to the planet Earth and it won an unceasing applause from the audience. The most riveting performance was the grand finale as the charismatic ingenious ethos of India ‘Dharohar –A Legacy’ was splendidly presented by the young learners and it was a thrilling visual treat. 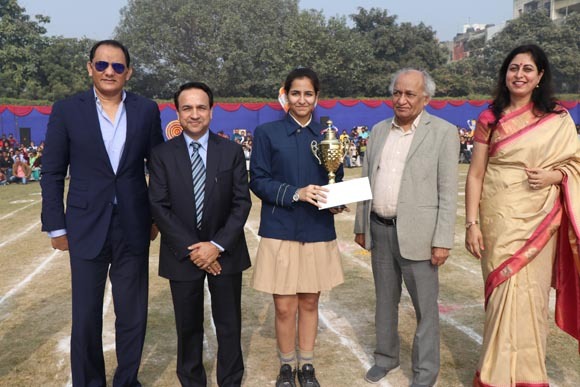 The function culminated with the much awaited prize distribution ceremony wherein the worthy Chief Guest bestowed the prizes to the most deserving athletes and meritorious students and motivated all to keep on persevering with sincere endeavors. The Chief Guest Mohammad Azharuddin addressed the gathering with his motivating words and emphasized on the need to keep abreast with the change in order to become a global citizen. The programme culminated with ­­­­­­­­­­­­­­­­­­­­­­the Pre Primary Coordinators , proposing the vote of thanks.